Engineer Hussein Farah departs Metro for cabinet post in Somaliland. Hussein Farah, an engineer who’s been managing facilities contracts here at Metro, has been appointed to the cabinet of the newly elected president of Somaliland. The Republic of Somaliland, where Hussein was born in 1957, is is the size of Greece, bordering Somalia and Ethiopia with a coastline that stretches some 456 miles along the Red Sea. Somaliland President Ahmed Mohamed Silyano announced the appointment of Hussein as the Minister of Mining, Energy and Water Resources on July 28 from the country’s capital city of Hargeisa. Hussein holds dual citizenship in his native country and the U.S. He will serve in the cabinet under his official birth name of Hussein Abdi Dualeh. Located on the east horn of Africa, Somaliland is a republic the size of Greece, bordering Somali and Ethiopia with a coastline that stretches some 456 miles along the Red Sea. Somaliland, which Hussein vigorously distinguishes from the country of Somalia, was a British Protectorate until 1960, when it gained its independence and entered into a hopeful union with neighboring Somalia, then recently liberated from Italian control. That union dissolved into a ten-year civil war that lasted until 1991, when Somaliland proclaimed itself as an independent republic. “With a free electorate who have built a stronghold of domestic policy, Somaliland has effectively sidestepped the land mines of warring factions, extremism and the infestation of piracy tactics used by neighboring Somalia,” said Hussein. In the service of his country, Hussein will be managing oil and gas exploration concessions sought by an increasing number of global concerns. He also will be responsible for energy and ground water development. A closer view of Somaliland. He comes prepared. Hussein graduated with a degree in petroleum engineering from the University of Oklahoma in 1983, followed by five years in operations with Chevron. He joined Metro in July 1989 and today manages nearly 100 million dollars worth of maintenance contracts, including the CNG fueling systems used by Metro’s bus fleet. Hussein counts his memories along with blessings from his 21 years at Metro. “Metro gave me experience in my profession and also an experience in life. I met a lot of good people here, both personally and professionally. It was a good tour,” he said. 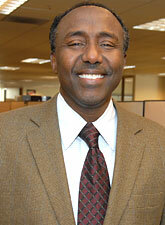 Hussein Farah, 53, resides in the northern Los Angeles County community of Stevenson Ranch with his family. Although Hussein will re-establish residency in Somaliland to serve in the cabinet, traveling and new media will keep him in near-constant communication with his family, who will remain at home in California while the young sons continue their education. Hussein will travel to Washington D.C. to meet with officials before taking up his post in his homeland in September.